Inside: Is food eating away at your pocketbook? Find tips on how to stick to a budget at the grocery store. Outside of housing, the grocery bill can be your biggest budget buster. Isn’t that crazy? Back when we were a double-income-no-kids (DINK) couple, we would gladly shop at the upscale local grocery chain and frequented local restaurants. I cringe a bit now thinking how much money we could have been saving by being even a bit more frugal. Now as a single income family, I’ve really cut back on our food spending. How? Yep, I said it again. Plan your menu. It is just that important when you are trying to stick to a budget. Have you ever been shopping thinking you only need 1-2 bags of food and you leave with a full cart? And I’m going to bet a lot of that was impulse buys or junk food. And I get it because I’ve done it myself. Then at the end of the month, you are either living off rice and ramen (because you are sticking to your budget, which has been depleted) OR you are looking at what you’ve spent and decide NOPE! Our family of 3 just plain eats $1200 of food every month. If you plan what you are eating for the week, you know exactly what to buy and chances are you will buy less and waste less. You can even take it a step further. I’ve started watching sales on meats more closely and stock up (within reason) when the price is low. As I put items in the freezer, on the calendar for next month I’ll mark a day as “ground beef” or “chicken”. This lets me know what I have on hand in the freezer (so it isn’t forgotten) and makes menu planning for the next month that much easier. I can see there is meat for 3 meals that use ground beef, 2 pork shoulder, and 5 chicken breast. Basically, I’m now buying meat about a month in advance. Where you buy your groceries can make a huge impact on your grocery budget. There may be a nice, upscale grocery store near you that specializes in organic foods. But how much are you spending there versus the store 5 miles away that charges half as much, or the store somewhere in the middle for both price and distance? If it has been a while since you comparison shopped, then set aside an afternoon to browse the aisles of a few different stores. Start by asking your friends and acquaintances where they buy groceries. Then make a list of your most frequently purchased items with a column to note the price at each store. Your list might include things like 2.5 lbs frozen chicken breast, loaf organic whole wheat bread, 3 lb. bag of onions, 1 can diced organic tomatoes, 1 box rice cereal, 1 lb coffee, etc. I’ve noticed the exact same brand can of beans may normally be $1.69 at one store and $0.68 at another. There really is that much of a difference! After you’ve done your field trip, you may have a new favorite store or two. What do we do? I use a few different stores. Weekly, I go to the neighborhood store for items that are inexpensive there. Monthly I go to Costco and WinCo. Then I’ll also watch weekly flyers at a couple other stores in the neighborhood and take advantage of any especially good deals there. If you have a deep freeze, use it. It is a great way to stock up on meats when they are on sale as well as for storing an abundance of freezer meals. Even if you have a regular refrigerator/freezer combo, you can still make and store a couple weeks worth of freezer meals. That alone will help you avoid spending money on eating out. Speaking of eating out, by cutting back on this you’ll have an instant win. I am NOT going to say you can never go out or get takeout. No. If you want to go that far, go for it. However, if you go out more than once a week, try and cut back on the frequency. If you want to make a lot of the same meal, just make a double/triple/quadruple batch and plan on eating a lot of leftovers. You can make this a little less tedious by freezing portions. Let’s say it is winter and you like chili. Well, make a huge pot of it and divide the leftovers between containers or gallon bags that will each hold another dinner’s worth of chili. You could also cook and shred several pounds worth of chicken. Divide the chicken and freeze to use later in a variety of recipes. Some people can batch cook and eat the same thing all week. More power to ya if that is you. I need some variety. Leftovers for lunch, okay. But the same dinner more than twice a week? Nope. Variety is the spice of life. When batch cooking, a batch of soup may come out of the freezer 1-2+ weeks after it first made an appearance. That shredded chicken? It could become burrito filling, go in soup, be part of a bbq sandwich, or more. Don’t think of batch cooking as having to eat the same thing over and over and over. It does allow you to mix things up a bit while saving money. A bit of time investment up front will reap rewards with time savings later. Whether you use pen and paper, a whiteboard on the refrigerator, or an app like Out of Milk (my favorite), keep a list. Whenever you run out (or are very low) on an item, add it to the list. Low on milk? Put it on the shopping list. Last loaf of bread? It goes on the list. Pulled out a pound of ground beef, but see 3 more in the freezer? It does NOT go on the list. Between keeping up on your staples and checking for ingredients you need for the meals you’ll make during the next week, you’ll have a smart grocery shopping list that will help keep you on a budget because you won’t buy things that aren’t needed and you’ll remember to get what you do need. And that free app I mentioned (Out of Milk)? It can also store prices of items, so you’ll know what the total is before you get to the checkout. And no, I’m not an affiliate for them, their app has just been really useful for us for the past few years. Have you ever gone shopping while hungry? I have and it isn’t a good idea. Why? Chances are you’ll grab a snack bar (or box of them), candy bar, gum, a bag of chips or even a bunch of convenience food you can dive into once you get home. And none of it was planned. Or, have you shopped with little kids? Sometimes things end up in the cart you weren’t aware of or the kids beg and beg and beg for something that you end up buying so you can stop the whines. If those scenarios sound familiar, try to shop after a meal and leave the kids home with your partner or at a friends house. Then, when you go to grocery shop on a budget, it will be more enjoyable and easier to avoid grabbing things from the special end cap and checkout displays. Whether money is tight or you want to make cuts to the grocery budget to you have more money to spend elsewhere, you can do it. Start by tracking what you currently get and how/where you shop. That alone will get you started. Your efforts will be rewarded! 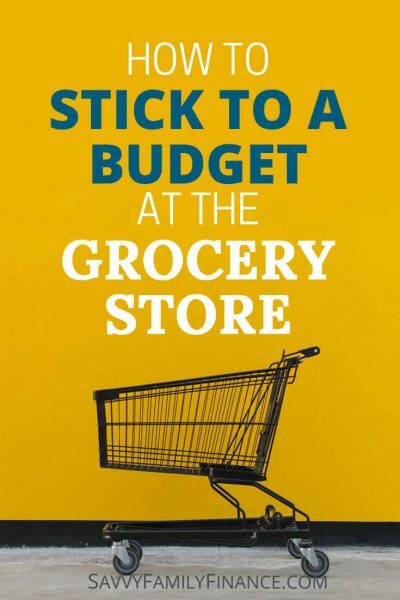 How do you stick to a grocery budget?